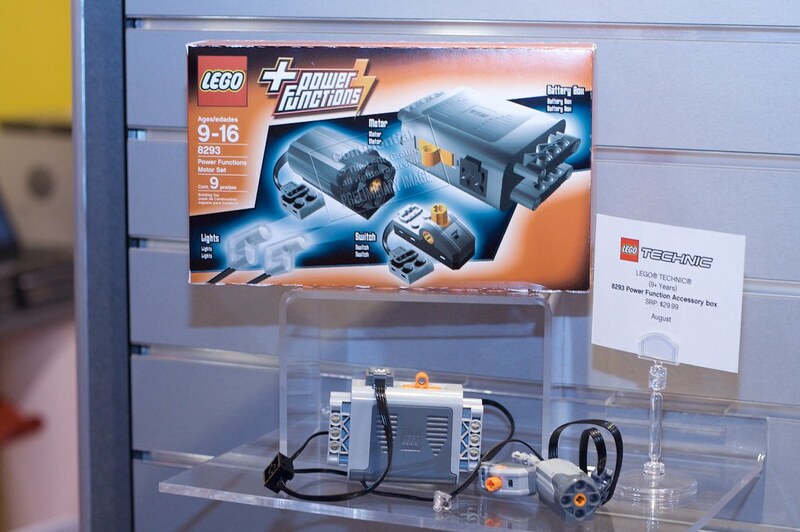 Sinner just posted at Eurobricks, a new and better photo from the upcoming Power Functions Motor Set (8293), taken today at Toy Fair 2008 (NY). At least we can confirm a suspicion that was discussed at this TBs post last week. The Pole-Reverser (or Switch as written in the box) has in fact a PF connector on its body, in addition to the one at end of its tied wire. From the side label, Suggested Retail Price (SRP) in US is $29,99 and its availability is expected for next August. See  and  for previous TBs references to this set. May be the hole is somehow used to invert the polarity setup!?? If you look at the high-res image here, you see next to it, the same symbol we have bellow the black switches on the PF Remote (just the switch is not there). Well... taking a better look, it really looks like a switch that moves on the horizontal. This set looks fantastic - I mean, to get a battery box, medium motor, pole reverser, a clutch gear and two new universal joints for only 32 euros! To be honest, I don't really think we can work out what how the pole reverser works, without actually owning one! I don't really understand what pole reversers actually do, as I do not own the old version. Are they able to power two functions with one motor? Or are they meant to do something else? With a Pole-Reverser, you can for instance revert the rotation from a motor (w/o a remote). It justs switches the position of PF C1/C2 signals, I guess.